One of the more amusing fake-motivational posters available on the Net. Yesterday morning, I walked out of my condo and saw that someone had stolen my doormat. All of my neighbors’ doormats had also been stolen. I don’t get this. It’s not like doormats have any resale value or anything. So it’s probably some college students doing something stupid, or some meth-addled idiot doing something stupid. Hope it’s the former. Fine-tuning bits of the software project all yesterday. It looks like I’m going to have to add a parser to get the “plot” configuration files working the way they should. fgets() followed by some simple search-n-replace code should do it. This particular bit would be so much simpler in Perl, but there’s no way all of the other stuff would be simpler in Perl. There are always tradeoffs…. This Coke bottle is 4 stories tall, and the interior of it is a store selling all kinds of cheap Coke merchandise. It really sums up the touristy parts of Las Vegas in a lot of ways. The autoconf and automake utilities have a real documentation gap. I thought autoheader was supposed to find all the header dependencies in a set of C or C++ programs, and squawk if important headers are not found or unfindable. Well, it doesn’t quite work like that. You have to write rules for all the headers , include directories, and libraries manually in another file. The online tutorials don’t mention this, naturally. However, there are plenty of relatively simple programs out there that use autoconf and have already-working Makefile.am and configure.in files. I’ll probably end up taking one of those programs and modifying its working setup, rather than trying to write something from scratch. The program is working, but there’s currently no way for users to save files or load them. That makes it less than useful. Saving and loading shouldn’t be difficult, but doing all the necessary error-checking will be semi-tedious. At least I can use GtkFileChooserDialog for the user interface part of the load and save functions. Finished reading Armor by John Steakley. It was interesting, but I thought it was flawed. It started by telling Felix’s story, which was fairly interesting, then switched to Jack’s story, which was only tenuously connected to Felix’s story and much less interesting. And it took over a hundred pages before Felix showed up again and the connection between the two stories became clear. Although the main characters got their conflicts and plots mostly resolved, there was no resolution to the whole problem with the ants. Oh well. More old raytracing pics. I tried to regenerate the good definition for the “X1″ spaceship that got deleted, and got this. Been banging on my programming project. It’s almost in a semi-usable state. It needs tons of graphics and I’ve only drawn about 4 of those. The parts without graphics are working fairly well. What comes next? Code cleanup! While it works, there’s a chunk of ugliness currently in the main loop that really needs to be a separate function. Also, I need to write saving and loading code, and improve the error handling so that it doesn’t crash even if the data files are totally messed up, and find out how to set up automake/autoconf so that it can be built on other systems with minimal fuss. I haven’t heard anything from the vet about the results of Fuzzball’s CAT scan. This is a little odd, but at least she’s still eating and drinking and meowing. Technical interview on Tuesday with the company where I took those 3 tests. I rocked 2 of the tests and probably got a mediocre score on the 3rd. So anything could happen on the interview. Vampire head drawing, done a very long time ago. This one didn’t turn out quite as well as I’d hoped. I saw a foreclosure notice taped to the door of one of the condos in my building when I went to pick up the mail. How wonderful. In the months ahead, I wonder how many more of those there will be. Took the tests that company wanted me to take. The first one was pretty easy; there was only one question that I didn’t know right off the top of my head. The second one was a lot harder. I don’t know how well I did on the second one, probably not that well. The problem is that many people have bought into the idea that all databases everywhere must be normalized to at least level 2 or 3, and that level of normalization makes many queries more complex than the same queries would be on less-normalized tables. And I’m not as good at database design and SQL as I am at general programming, since Dan and Mark handled all the database design and most of the SQL at the old company. Oh well, it’s out of my hands now. Fuzzball: got her CAT scan. The odd thing is that they didn’t know how much to charge me for it, since the radiologist isn’t finished looking at the pictures yet. It might be expensive. Signs like this should be on most science labs, places where students gather, and houses where students live. Heard back from one place that I’d contacted about a job, they said that I’d done really well on their first test. This is not surprising; I have always done well on tests. But they want me to take more tests. What the heck, I’ll do that. They really want me to relocate to New Jersey, but that won’t work out at all for me right now. Oh well, we’ll see what happens. Fuzzball goes to the vet this morning for her X-rays. She’s really annoyed that I haven’t fed her. After that, I’ll be taking tests. One of the performers at the Ren Faire used these 2 ducks in his act. He had a sign that said, “Beware of Attack Duck”, but when I took a picture of the ducks and the sign, I cut off the bottom of the sign. So I’ve reproduced the sign in a caption. We got first place in trivia last night, which was great. Zach and Nathan also had this idea for doing something which sounded like a low-budget 80s movie. On the other hand, I heard from one of the folks at the Phoenix Police recruiting booth that the city government of Phoenix might have some open positions for the technical things that I can do. Being a government employee might be OK. One of the guys in the Lansing Linux Users Group worked for the state of Michigan, and he said that was a pretty good gig with only a few bad things about it. We’ll see how it works out. 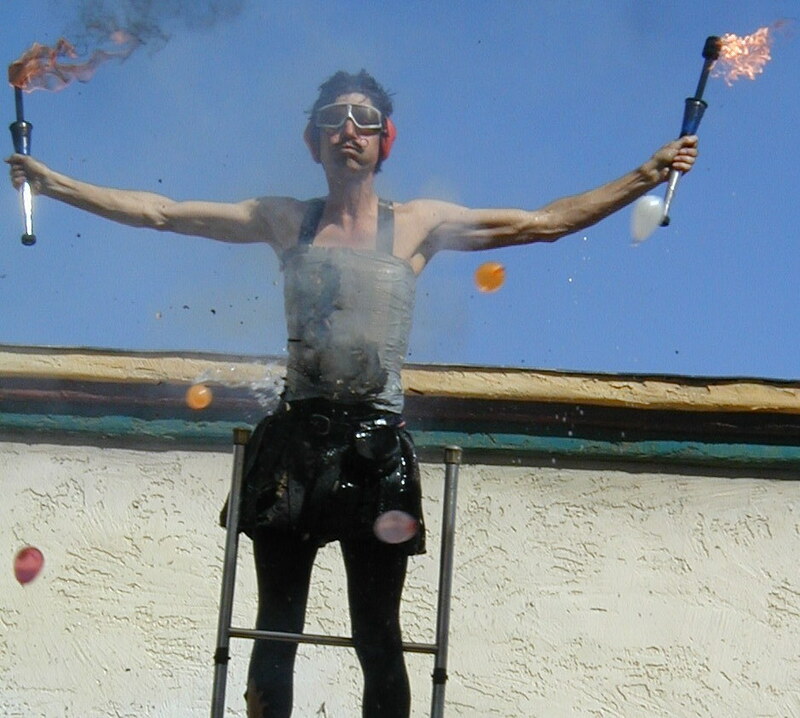 Dexter Tripp balancing on a ladder, while firecrackers taped to him are going off, and people are throwing water balloons at him. What’s not immediately apparent from the photo is that the ladder is not leaning against anything. Yes, he’s balancing the ladder, without the use of his hands, while things that he’s duct-taped to himself are exploding and people are throwing water balloons at him. I don’t know if this guy is entirely sane. But he does put on a good show. Fuzzball Update: The vet said she’d improved some and had gained a little weight. But they still want to take a look at her temporal-mandibular joint using an ordinary X-ray with the addition of some contrasting dye to her bloodstream. (This costs less than a CAT scan and is almost as good for what they need to look at.) And the radiologist won’t be available until Thursday, so I have to bring her in again. I just hope she’ll be OK. I went to Kinko’s to try to print off a bunch of copies of my resume for the job fair today. This was more annoying than I’d thought. I had to rent a computer at $0.40/minute, then find that the machine I rented wouldn’t see the USB keychain drive that I’d brought. Fortunately, the machine could see the Net, and I’d stashed a copy of my resume on the publicly-accessible parts of my web page. And then someone printed a really complex document that took the printer 3 minutes to render, and did it right before I printed my resume. Thank you, unnamed person, for costing me another $1.20. If I have to do this one more time, it’d be worth it to buy a printer. I didn’t have one for a long time, because I almost never needed to print anything out and I could always use work’s printer if I did. Not any more. For lots of ephemeral stuff, paper is obsolete, yet there are people who insist on using it. 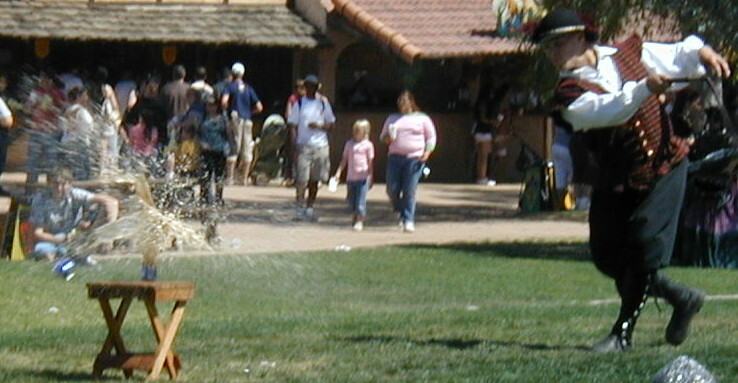 Here we see Adam Crack exploding a can of Pepsi using a bullwhip at the AZ Renaissance Fair yesterday. Sorry, this is the best picture of his act that I got, and the ones I took of the whips that were on fire were just not good at all. The fair was interesting. Carpooled with John, met Zach and Sara there, also met Nathan there. I didn’t know if Nathan was going to come or not, so it was a pleasant surprise to see him. We all saw a bunch of the shows and had authentic medieval fried chicken and chips and spent a lot of time walking around and people-watching. Many of the shops there were selling things like pewter dragons, wooden swords, jewelry, and all kinds of fantasy-themed art. The shops selling handmade boots, leather armor, and weapons were more interesting. They looked well-made, and really, who wouldn’t want a wakizashi hanging on the wall? Everything really interesting was out of my price range though. I settled for food and giving a couple of bucks to the performers whose shows I enjoyed. Dexter Tripp, rope-walker, contortionist, juggler, and daredevil, was especially entertaining and we went to see two of his shows. Pictures of his act in the next post. Well, it’s Easter, so here’s a captioned rabbit. The Plan(tm) is to go to the Arizona Ren Faire today with Zach and Sara and John. This should be interesting. I’ve heard about these fairs but have never been to one. Hat, sunglasses, sense of humor, money, that ought to do it for preparation. Here’s hoping traffic on US-60 won’t be terrible. John said it often was, though. We’ll see what happens. The config file parser is working fine (no bizarre runtime warnings reported) but getting it fixed was weird. Setting up the buttons can be done in several different ways. I did it one way, which worked. Then the buttons started behaving weirdly for no discernible reason. All the docs said the way I was configuring the buttons should work just fine. So I tried configuring the buttons the other way (which is slightly more verbose), and everything started working again. As a side effect, all the weird runtime warnings went away. I’m used to incomplete and incorrect documentation making programming harder than it should be. This is a new one on me, since the GTK+/Glib documentation should be complete and correct. And then, I spent half an hour wondering why my lists were coming back as “0;5;3″, NULL, NULL when they should’ve come back as “0″, “5″, “3″. Turns out that the g_key_file_set_list_separator function wants (file,';'), and if you give it (file,";"), it won’t work. The compiler warns you about that, but I had all the warnings turned on, and I missed that important warning in a slew of non-important warnings. Long ago, this was what the wall of my old office was like. I drew (or built the source in a text editor and then rendered, for the yin-yang, spaceships, and geometric solids + checkerboard metal) all the images displayed here. I took the paper down when the old company moved from Lansing to Holt, because I had a feeling they’d move again soon. That was correct; they moved to AZ and now I’m stuck here. I still have all of these pieces, but I haven’t put them up anywhere. Fighting with Glib now. I have things working properly with the program dynamically building part of its interface from its config file at runtime. However, the program spews a bunch of completely silly and paranoid warnings to standard error when run from a konsole. I think I know why this is happening and a way to fix it, though. The Grand Plan is to make it so that people only have to change the config file and not the program’s code to change lots of things about the program’s behavior. That’s not going to work completely. I’m going to have to hard-code a number of things or the config file syntax will get too complicated to manage. The key is to hard-code as little as possible.